Learn how to roll with the punches, address various challenges and be an effective producer in a competitive and complex landscape. Assia Boundaoui (The Feeling of Being Watched), Kimberly Reed (Dark Money), Jon Olshefski (Quest) and Caitlin Mae Burke (Obit.) focus on ways you can build trust with documentary subjects and communities. Moderated by Sean Flynn (Points North Institute). Christopher Quinn (Eating Animals), Lindsay Firestone (Bloomberg Philanthropies), Anya Rous (Multitude Films) and Simone Friedman (EJF Philanthropies) discuss effective measures of impact producing and campaigns. Moderated by Sarah Nelson Wright (Marymount Manhattan College). 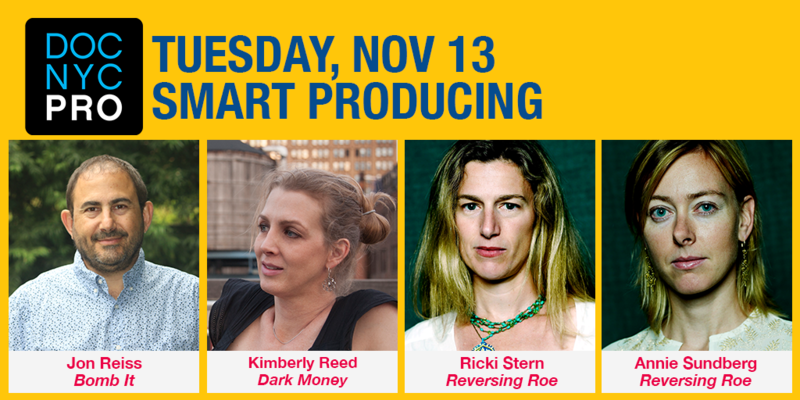 Reversing Roe directors Ricki Stern and Annie Sundberg of Break Thru Films discuss working with production and distribution partners and growing a production company. Moderated by Julie Anderson (God is the Bigger Elvis).